In the first year without Kyle Shanahan running the offense, the Atlanta Falcons saw their offensive output drop from a league-best 33.1 points per game to middle of the road (22.1 PPG, 15th) in 2017. Not only did Devonta Freeman miss two games after leaving Week 10 in the first quarter with a concussion, but he dealt with MCL and PCL sprains down the stretch. Yet as the lead back of the team's 1-2 rushing attack with Tevin Coleman, Freeman still managed to finish as fantasy football's RB13 (PPR's RB14) in 2017 despite those injuries and the team's overall offensive decline. Before last season, however, Freeman finished as fantasy's RB1 and RB6 in 2015 and 2016, respectively. Over the past three seasons, only three running backs have more yards from scrimmage than Freeman (4,357): Todd Gurley (4,599), Le'Veon Bell (4,522) and LeSean McCoy (4,396). Only three running backs -- Duke Johnson (188), Theo Riddick (186) and Bell (184) -- have more receptions than Freeman (163) over that same span. Not only has Freeman been highly productive on a full-year basis, he has provided fantasy owners with both weekly consistency and upside. From 2015 to 2017, Freeman has 28 games with double-digit (standard) fantasy points. Only McCoy (30) and Gurley (29) have more. In addition, Freeman ranks third in games with 15-plus fantasy points (18) and 20-plus fantasy points (10). Despite a change in offensive coordinator, the Falcons once again ranked 11th in run-play percentage. In fact, they ran the ball a little more frequently -- 43.86 percent in 2017 vs. 42.27 percent in 2016. In terms of blocking, Atlanta's offensive line was ranked second (behind only Philadelphia's) according to PFF. Meanwhile, Austin Hooper earned PFF's eighth-best run blocking grade (80.7) among tight ends while posting sub-50 grades for receiving and pass blocking. Freeman ranked 10th in red-zone rush attempts (34) in 2017 as he received 63.6 percent of the team's rush attempts inside the 5-yard line. Missing two games in 2017, those numbers were down year-over-year. Even though teammate Tevin Coleman has 19 touchdowns in the past two seasons, Freeman is tied with Gurley for a league-high 35 touchdowns over the past three seasons. Based on the fantasy points allowed to opposing running backs last season, Freeman and Atlanta's running backs have the sixth most-difficult strength of schedule for Weeks 1 to 16 in 2018. It's even more challenging in the fantasy playoffs (third most-difficult) with matchups against the Packers, Cardinals and Panthers from Weeks 14 to 16, respectively. In my mind, there is little distinction between Freeman and the RBs going immediately before him -- Leonard Fournette (1.08), Melvin Gordon (1.10), Kareem Hunt (1.11) and Dalvin Cook (1.12). That said, there are plenty of question marks in the next tier of backs -- Jordan Howard (2.05), Jerick McKinnon (2.08), Joe Mixon (2.09), Christian McCaffrey (2.12) and Derrick Henry (3.02). A versatile do-it-all back, Freeman is one of the safest second-round picks. 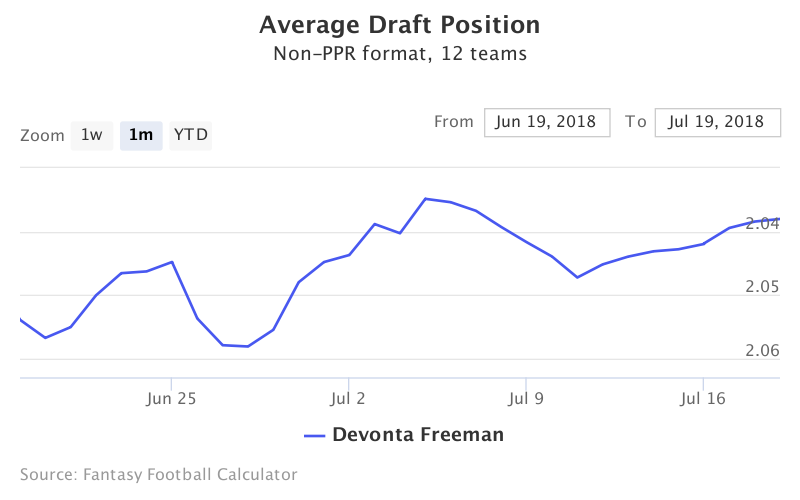 Although his ADP and my ranking are equal (RB11), there is a significant dropoff from Freeman to the next tier of running backs. The gap in my fantasy football projections between RB11 (Freeman) and RB12 (Howard) is twice as much as the gap between RB5 (Saquon Barkley) and RB11 (Freeman).